In 1390 Perugia, then a free city called comune, granted the premises to right to the gothic portal to the Merchants Guild, one of the most important in town. 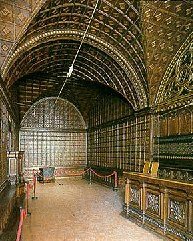 Unusually for Italy, the Sala delle Udienze (Council Room) was completely panelled in wood in the 15th century, probably by German craftsmen. The first section of the right hand wall is decorated with blind twin-windows and fretwork. The coat-of-arms in the lunette represents a griffin clasping a bundle of merchandise - the symbol of the guild. The large Renaissance reading desk was made by a local craftsman in 1462. Against the left hand wall there is a small inlaid pulpit with columns, surmounted by bas-reliefs representing Prudence, Force, Justice and Moderation. The archives contain inscription registers that run from 1323 to 1599. Closed on: December 25th, January 1st, May 1st.